"This township possesses a very large proportion of first-class land, and farm property is changing hands readily at good figures. The reputation of Huron stands high as an agricultural district; goods roads, good fences and level land, little or no stone, it is fast becoming an ideal township. The chief drawbacks are scarcity of wood and water, although a large number have overcome the latter want by drilling deep wells and pumping by wind power. There are two light streaks across the township, the quality of which is very poor, which our figures will bear out. The Lake Range affects this township somewhat, but not to any very great extent, as the good land comes much closer to the lake shore than in the townships to the north. The rate per acre for Huron, including the village of Ripley, is $37.31, Ripley making a sum equal to $2.25 of this amount per acre." The lands in the township of Huron were among those known as School Lands, and were among those offered for sale [See Appendix J.] July 30th, 1852. A number of squatters had entered the township prior to the date of this sale. The names of several of these are mentioned as among the very earliest pioneers of the county in the second chapter of this book. The author has had an opportunity of examining the field notes of the survey of this township made by E. E. Jones, and has placed in a footnote what he has found relating to settlers at that time in the township of Huron. The extract [Footnote 1] is long, and the author's excuse for inserting it is because it is perfectly authoritative as to the names of the actual first settlers on the Lake Range and iheir date of settlement. The point made clear by these field notes of the surveyors is that the settlement of the township was at first confined almost exclusively to the Lake Shore Range. It is not difficult to arrive at the reason why this should have been so, which was its accessibility in summer by water and in winter on the ice. Then the smooth, wide beach provided a highway on which one could travel north or south with but little difficulty. One settlement, however, was made as early as October, 1849, back in the township, these brave pioneers being Malcolm McRae and his son "Big" Duncan, Alex. McRae and his two sons, "Red" Duncan and Donald-Buie, Finlay McLellan and their families. The land they took up was on the first concession five miles back from the lake. Of all the pioneers of Huron, Louis Bellemore is credited with being the earliest, he having in the year 1848 settled on lot 19, Lake Range, at the mouth of the Pine River. Here he had a tavern patronized by land-seekers, they being about the only species of travellers that ventured into the wilds of the county at that time. Bellemore sold out his squatter's rights to David Walden in the following year, when he moved north to lot 36, where he again opened a tavern, referred to in Chapter III. Among other of the earliest settlers on the lake shore might be mentioned the name of James Keys, who had squatted on lots 22 and 23. He was the first to fall a victim to the perils attending pioneer life in the settlement. His death came about in this wise: In August, 1851, he was engaged in taking a raft laden with supplies to Penetangore, his sole companion being his stepdaughter, afterwards Mrs. Henry Teskey. He fell into the water, and although quickly pulled out, he could not be resuscitated. His widow sold the squatter's rights to John Hunter. There was also one Joseph Lindsay who met with the sad fate that has overtaken many a backwoodsman, being killed by the fall of a tree which he was engaged in felling. In the Pine River cemetery, on a tombstone more than half covered with drifting sand, there can yet be made out the words, "Joseph Lindsay—1853." His widow sold out her rights as a squatter in 1853 to Thomas Welsh. The vicinity of the mouth of Pine River is said to have been, before man had marred it, one of the most beautiful spots to be found along the lake shore. The river's banks were timbered almost to the water's edge. To the north of the river was a grove of red pines that grew as if planted in an open park. What to-day is drifting sands was at that time covered with a carpet of vegetable mould studded with pine needles and patches of green moss, soft and enjoyable to walk upon. A sleigh track was cut through the woods of Ashfield in the winter of 1849-50, and the lake shore road through Huron was cut out in 1853, a substantial timber bridge at the same time being placed across Pine River. Thomas Blair was the contractor for the work done in this last-mentioned year. What a lovely drive it was along that road. On one hand, as seen through the openings in the evergreens, was the seemingly limitless expanse of the waters of Lake Huron beating with rhythmical flow on the hard, sandy beach. On the other hand was the dark verdure of the evergreens, through which the road had been cut, and which filled the air with a resinous perfume mixed at times with that of a Balm of Gilead tree. In addition to this there was always that cool, exhilarating freshness of the breeze that had passed over the miles and miles of waters of Lake Huron. In some places deep sand made the road heavy, but this provided an excuse to slow up and be satiated with the beauty nature had so freely supplied. This road lost much of the travel which at one time passed over it when the Goderich road, extending north from Amberley, was opened. As is elsewhere pointed out, the settlers who first peopled the county of Bruce were, as a whole, of numerous and varied vocations, and in regard to nationality they were pretty thoroughly mixed up. This heterogeneity served a good purpose in the making of the county. 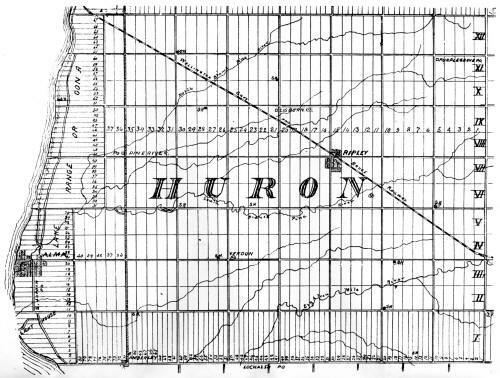 Huron Township received at one time, in the fall of 1852, a large group of settlers, sufficient if so allocated to have taken up every lot on three concessions, who differed in every respect from the foregoing. This was the Lewis settlement. It consisted of one hundred and nine families who took up land in the centre of the township. These were all from the Island of Lewis, and had been evicted from their croftings by their landlord, Sir James Matheson. Laboring under the disadvantage of being able to speak English but imperfectly —Gaelic being their mother tongue, many, indeed, could speak no other—and whose calling was that of sailors or fishermen, they were utterly ignorant of how to set to work to clear up a bush farm, and lacked also the necessary experience how to work it after it had been cleared. In addition to this, being settled close together they had consequently no opportunity to study the object lesson which a native Canadian backwoodsman in his daily task of chopping, logging and ploughing would have set before them. Is it any wonder, then, when all these circumstances are considered, that the progress of the Lewis settlement was at the first slow. The author has been favored by Mr. Angus Martyn, of Ripley, a son of one of the Highlanders from Lewis, with a short account of the movement which brought this large number of families to settle in Huron. The following is Mr. Martyn's account: "The Highlanders from Lewis, Rosshire, Scotland, who settled in Huron emigrated to this country in 1851. Two shiploads left Stornoway, in Lewis, in that year. They were nine weeks and four days in crossing the Atlantic. They came on sailing vessels and landed at Quebec on the 4th August, 1851. They then went by boat to Port St. Francis, where the party of emigrants divided, the majority going to the county of Compton, Lower Canada, and the remainder went on the same boat to Montreal, from there by another boat to Hamilton, touching at Toronto. From August to December they remained in Hamilton, the men working on the Great Western Railway, which was then in course of construction. Smallpox broke out among them in Hamilton and carried off many. In December they scattered, going to Guelph, Stratford, Galt and Goderich. All met in Goderich in the summer of 1852. Some more emigrants from Lewis came to Canada in 1852 and joined the others at Goderich in the fall of that year, when all moved to Huron Township in the county of Bruce. There were one hundred and nine families in all. The names of the heads of the families are given in a footnote. Names of the head3 of families who settled on the 7th concession of Huron: Donald Smith, Angus Smith, Malcolm McLean, William McDonald, Christina Smith (widow), Murdoch McLeod (Shepherd), Malcolm McIver, Angus McIver, Angus McDonald, Donald McDonald (Councillor), John McIver, James McIver, Donald McDonald, Allan McDonald, Donald McDonald, Norman McLean, John McLean, Angus McDonald, Alexander McDonald, Donald McDonald, Allan McLay, Angus McDonald, and John McDonald (Keeper), and Angus Graham. Names of the heads of families who settled on the 9th and 10th concessions: Malcolm Campbell, Malcolm Smith, William Smith, Murdoch McLeod, John McLeod, Malcolm McIver (Elder), William McLeod (10) Donald McLeod, Malcolm McIver, Angus McFarlane (10), Kenneth McDonald, Alexander McKenzie (10). Names of the heads of families who settled on the 11th concession : Donald McGregor, John McGregor, and Murdoch McGregor. Names of the heads of families who settled on the 5th concession: Angus McDonald, John McDonald (Dorrie), Angus McKay, John McKay* Angus McDonald, Murdoch McFarlane, Donald McLeod, Edward McLeod Malcolm McLeod, Donald McIver, Angus McArthur, Murdoch Martin and John McDonald. Names of the heads of families who settled on the 6th concession: John McKay, Malcolm McKay, John McKay, Norman McKay Angus McKay, Murdoch McKay, Duncan McLeod, Malcolm McLeod John Murray Donald McLeod, John McLeod (Elder), Donald McGregor, Malcolm McGregor, Donald McLeod, John McArthur, Neil McArthur, Murdoch Mc-Ritehie (from Cape Breton), John McLean, Malcolm McDonald Angus McDonald, Murdoch McLeod, John McLeod, Angus McKay (Og), and John McKay. A process of evicting by the proprietor of the island of Lewis was the cause of the emigration of this large number from one locality. To smooth over the heartlessness of eviction the proprietor of the island offered a free passage to any part of Canada to any one who was willing to emigrate, and at the same time offered to purchase their horses, cattle and sheep if they could not otherwise get sale for them. The men among the passengers were all fishermen, as accustomed to the sea as the crews of the vessels on which they crossed the Atlantic, and so during a severe storm were able to render valuable aid in weathering the gale. One of the ships lost two of her masts during this storm and to ease her fifty tons of pig iron were cast overboard. During the first year of the settlement in Huron these hardy pioneers had to get their supplies, flour, etc., in Goderich, from which place they brought them on their backs, along the lake shore to the foot of the eighth concession, and thence home through the bush." If these Highlanders came into the bush lacking in the knowledge possessed by an experienced backwoodsman, they were not lacking in physical strength and powers of endurance. It is related of one, who having purchased a hundredweight of flour at Kincardine, proceeded to carry it on his back the long fourteen miles to his shanty. He could have carried it in a bag, but on a barrel being offered him as a present, he placed the flour therein, and solely that he might have the barrel for use at home, shouldered it with the enclosed flour. Awkward as this was to carry he reached home in due time. When asked if he were tired after such exertion, he said, "Heugh no, but she'll be a little pit sore about the back." After the group of names already mentioned of men who are to be classed as the earliest of the pioneers of Huron, there are many who settled there at a date early enough to enable them to experience a full share of the hardships of backwoods life, early enough to have the call made on them to put forth all the strength of their manhood to maintain their families and at the same time hew out for them a home out of the tangled woods which covered the township. Of this second group there was John and Archibald Campbell, with their sister (now Mrs. Joseph Barker of Kincardine), Cowan Keyes, Thomas Welsh, William Welsh, [The author desires to express his thanks to Mr. Welsh for a number of facts regarding the settlement of Huron township, which he has incorporated in this chapter and to recommend to all who can do so the preservation of a series of letters on "The Settlement and the Woods of Our County," written by Mr. Welsh, which appeared in the Kincardine Review in the spring of 1904.] J. W. Gamble, John Hunter, Thomas Henry, Alex. McCosh, and Archibald McDonald. All of these resided on the Lake Range. Of those who settled back from the lake, a few names only can be here mentioned. There were the Stanley and Collins families in the north-east part of the township; Thomas Wilson and Robert Montgomery, who filled municipal offices at different times; Ninian Hyslop, and John S. McDonald. The last-mentioned settled on his lot in 1855, with no more of this world's possessions than the ordinary settler. Being a man of energy and ability, he soon came to the front, and, from being a township councillor, became reeve of the township, then warden of the county, and then represented the riding of Centre Bruce in Parliament from 1894 to 1898. Mr. McDonald had his own share of the hardships of the early days. In speaking of them, he said:— [Extract from the Kincardine Review.] "We used a wecht in cleaning our first grain. This wecht was made from sheepskins, with the wool removed. The skin was tacked on to a wooden rim, and was formed something like the end of a drum. We used this implement as a scoop to lift the wheat from the bin, and allowed the grain to fall from the wecht to a sheet laid on the ground, the wind cleaning the chaff from the wheat as the latter fell. One day when we were about out of flour there was no wind to clean the grain; about dusk, however, the wind came up and I kept on cleaning, in the way I have described, by the light of the moon until two o'clock in the morning. I did this after having threshed with a flail all day. Before daylight I was off with the grist, so prepared, to the Harris' Mill, beyond Dun-gannon, twenty miles away. All the settlers from about here took grists to this mill. The grist was usually carried on a jumper, and sometimes it would not consist of more than three bags of wheat. The journey there was made in one day, and the wheat was ground in the mill while the owner spent the night in the tavern near by, the return journey being made the following day. This tavern was a log cabin, and in going to bed upstairs we had to climb a ladder. The roof was just a little above our heads, and in the morning the ceiling was coated with frost from the air breathed by the men; our cowhide boots, in which we had tramped through slush and water in going to the mill, and which had been thoroughly soaked on our arrival, were frozen as stiff as bricks, so that we could not get them on until after thawing them out by the side of the stove." There were many Highland Scotch settled in Huron other than those from Lewis. The combination resulted in the number of "Mac's" being in such excess, that nicknames had to be used to designate the individual—such as little, big, red, black, long, short, and other adjectives. It is said that in school section No. 5 the John McDonalds had to be separately designated by a letter of the alphabet, as John A., John B., and so on, until John U. closed the list. The Donald McDonalds were as numerous, and were similarly treated, requiring all letters from "A" to "U" to distinguish one Donald from another. "Pine River" was the name of the first post-office established in Huron. J. W. Gamble was the first postmaster. This office was not located where the present "Pine River" office is, but on the lake shore, near the mouth of the river, and was opened in 1853. The mails were delivered by the Goderich and Kincardine mail carrier, who passed to and fro each way thrice a week on horseback. The author remembers on one occasion in the fifties travelling for company's sake with the mail carrier, each on horseback, and both mere lads. It was a warm summer morning as they left Pine River for Kincardine, and the cool waters of the lake looked so tempting that the despatch required in the conveyance of Her Majesty's mail was forgotten for half an hour, while the two lads frolicked in the water. The first sawmill in Huron is said to have been built in 1855 at Pine River by William Blair, and was run by his two sons, Thomas and George. The mill and water privileges were purchased some five years later by John Hicks, who had previously filled the position of head miller for William Sutton at Kincardine. Mr. Hicks on coming into possession added a grist mill to the plant. These mills were successfully run until a freshet, which occurred in 1868, destroyed both dam and mills. In 1856 Capt. Henry C. Gamble, an Irish gentleman of some means, came to Pine River on a visit to his brother, J. W. Gamble. The locality struck his fancy, and he decided to remain and do his utmost to develop into a business centre the town plot at the mouth of the river, surveyed in 1855, which consisted of parts of lots 18 to 22 of the Lake Range. The survey was known as the Alma town plot. Capt. Gamble obtained a transfer of the rights to the east half of lots 16 and 17 adjoining the Alma survey, and here he proceeded to erect a saw and grist mill. The government shortly after commenced the erection of the lighthouse [The Point Clark, or Pine Point, lighthouse commenced to show its light in 1859. It is a circular stone building, 87 feet high. The height of the light above high-water is 93 feet, and is visible for fifteen miles. The light is what is known as a revolving one, and shows a white light every thirty seconds.] at Pine Point. The combination of this work with Capt. Gamble's efforts made quite a stir for some time in the neighborhood of "The Point." Shortly after the opening of the Goderich Road the Pine River post-office was moved to its present more central locality. The loss of the office was followed by the forwarding of a petition asking for a post-office at "The Point," which was granted, and in 1860 Lurgan post-office was there opened, but subsequently moved further north. The name is that of a town in the north of Ireland, said to be the native place of Capt. Gamble. The attempt to develop a town at Alma or Lurgan proved to be a complete failure. After the sinking of a large amount Capt. Gamble gave up the attempt and returned to the Old Country. 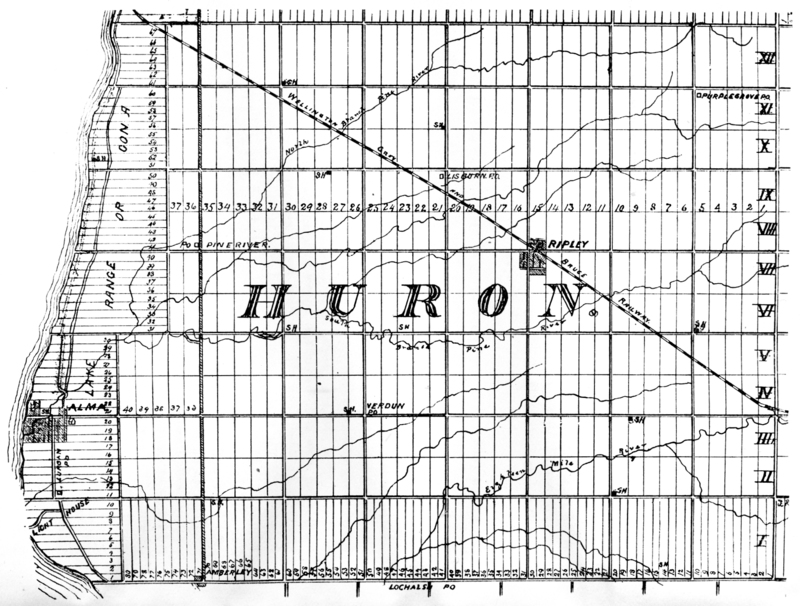 When the municipality of the united townships in the county of Bruce was dissolved, [See Appendix F.] at the end of 1853, and six municipalities formed out of it, the township of Huron was found to have a sufficiently large population and an aggregate assessment large enough to be able to assume the responsibility of separate municipal existence, unlike most of the other townships in the county, which had to unite in partnerships of twos and threes. The affairs of the young municipality in 1854, the first year of its existence, were in the hands of a Township Council composed of William Blair, Robt. Huston, William Wilson and Samuel Wright, over which John Hunter, as reeve, presided; J. W. Gamble acted as clerk and John Campbell as treasurer. 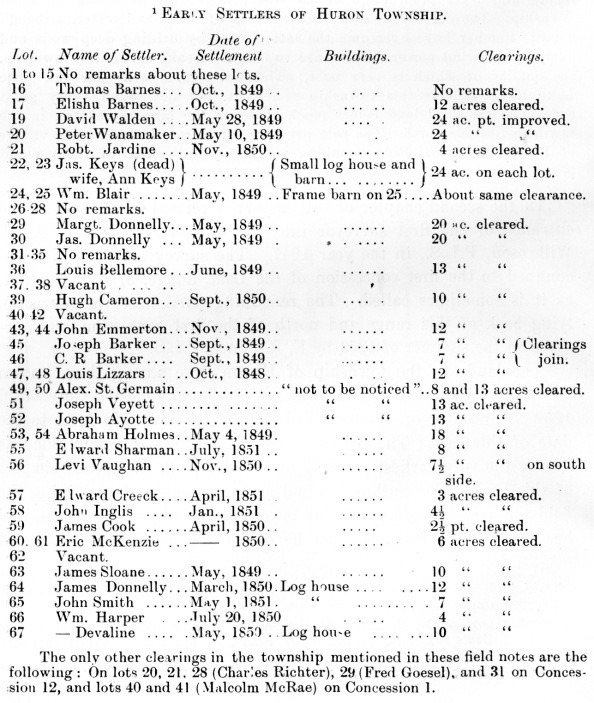 In a footnote [Names of the reeves of the township of Huron from 1854 to 1906 inclusive: John Hunter, 1854. '63; Ninian Hyslop, 1855; Malcolm McLennan, 1856, '57; John Good, 1858, '59, '67; Robt. Johnston, 1860 '62 '64 '65, '66, '68, '69, '70, '77; John McLay, 1861; John Stewart, 1871 '72 '73' '74; Thomas Yemen, 1875, '76; David Henderson, 1878, '79, '80,' '81' '82' '83; John Ballantyne, 1884, '85, '86, '87; John S. McDonald, 1888, '89, '90, '91; Robert Thompson, 1892, '93, '94, '95, '96; Richard Robertson, 1897, '98, '99, 1900, '02; G. H. Humphreys, 1901; James Brown, 1903, '04, '05, '06.] there is given the names of all who have had the honor of the reeveship conferred upon them. In the year 1855 there appears in the minutes of the United Counties Council, January session, in the "Report on the Validity of the Election of Councillors,' the following re "Certificate of the township clerk of Huron to the effect that Ninian Hyslop was duly elected town reeve. We find no evidence that the oath of qualification has been taken, nor is there any reason why this oath should be omitted." On the report being presented to the County Council the following motion to enable Mr. Hyslop to take his seat was carried, "That the affidavit of the clerk of the township of Huron to the effect that there were no parties rated in the township of Huron to a sufficient amount (£100) to enable them to take the oath of qualification is satisfactory." [Mr. Joseph Barker, who succeeded Mr. Gamble, in 1855, to the office of township clerk, wrote to the author in regard to this incident as follows: " The council-elect for 1855 were all fresh men, and the clerk, J. W. Gamble, felt sore and refused to give Ninian Hyslop the certificate required to enable him to take his seat ; because of such refusal the Council bounced Mr. Gamble and appointed the writer as clerk, and requested me to go with the reeve-elect to Goderich and explain the reason why Mr. Hyslop could not get his certificate from Mr. Gamble. The Counties Council, after hearing my statement, decided, by resolution, that Mr. Hyslop might take his seat on my giving certificate, which was done."] The above incident is recorded to show the impoverished circumstances of the first settlers in the township. In a wealthy community such as now resides in Huron, it seems incredible that there was a time in the history of the township when there was not one ratepayer who had enough of worldly goods to be assessed for four hundred dollars. The post-office at Ripley was established in 1856 at lot 4, concession 8, township of Huron. The first postmaster was M. MacLennan, [Malcolm MacLennan was long connected with the township of Huron. He was reeve of the township in 1856, '57, was a member of the Township Council for two other years, and filled the office of township clerk for ten years. He came, in July, 1852, from Cape Breton, with his father, _ to Goderich. In the following year they took up land on the 8th concession of Huron. It was not until January, 1856, he settled on this lot, having followed school-teaching in the interim. He was the third person who filled the position of teacher of the Kincardine Public School—this was in 1854. Mr. MacLennan some years ago moved to Algoma, where he still resides. A post-office there bears his name.] He had the office for two years, and was succeeded by Thomas Harris, the office being then located at his house on lot 2, concession 8, Kinloss. John Brown was the next postmaster, and the office was moved to lot 12, concession 7, Huron. The next move of the post-office was a permanent one. Donald McDonald, the next postmaster, resided on lot 15, concession 7, and there the village bearing the name of the post-office developed. The successor in office to Mr. McDonald was Paul D. McInnes. On the death of the latter the office was given to his widow "Ripley" ["Ripley" is the name of a town in Derbyshire, England.] was the name conferred upon this post-office in 1856, and was retained until 1874, the year Paul D. McInnes was appointed postmaster. He, wishing to have a name somewhat consonant with the native land of the majority of the population, agitated for a change of name, which was granted, and "Dingwall" became the name of the post-office. But as the railway station was called Ripley, and as this name had been associated for so many years with the post-office, it was found necessary to revert to the old name and in 1880 the post-office again bore the name of Ripley, which it has retained. When the railway company made Ripley a station, business soon focussed there. The year 1874, which witnessed the opening of the railway, also witnessed the erection of a number of buildings at Ripley. In the following year a visitor reported the village as having both a grist and a sawmill, six stores and a Presbyterian church. Shortly after this the town hall was built, and also three grain storehouses required by grain buyers, whose efforts made Ripley a good grain market. As the village developed the desire was felt by the inhabitants to have complete control over local improvements. To obtain this the County Council was petitioned to create Ripley into a police village, which was granted. The first Board of Trustees were elected in January, 1898. For years the banking of the village, and largely of the township, was done with a firm of private bankers, S. T. Jackson & Co. This business was purchased in 1903 by the Bank of Hamilton, who retained Mr. Jackson as its agent. In 1904.the Trader's Bank, on the outlook for a good opening for an agency, selected Ripley and opened an office there, thus giving the village banking accommodation not possessed by many places of larger size. A printing press for job work was started in the village by H. P. Chapman about 1889. In 1892 he commenced the issue of a newspaper called The Enquirer, which name was changed some two years later to that of The Ripley Express, a newspaper that still flourishes. The two Presbyterian churches at Ripley had as a common origin the first efforts to hold religious services when the settlement was but young. In 1855 a catechist labored in Huron holding services in the Gaelic language. These were held in private houses or barns, according to circumstances. In time the catechists were succeeded by students and probationers, and efforts were then made to organize a congregation and erect a church. These efforts were so successful that in 1858 a church was built on lot 14 on the 6th concession. It was built of hewed logs, and was supposed to seat four hundred persons. The congregation which worshipped there was one in a union charge, the other congregation being in the township of Ash-field. It was some years before a minister was regularly settled over these two congregations, the first being the Rev. Alexander Grant. The total stipend paid him was but $700, half of which was paid by each congregation. Services were held in each church on alternate Sundays. As the congregations grew it was decided to make of each a separate charge. This was in 1875. Rev. Mr. Grant continued with the Ashfield congregation, leaving the Huron congregation to seek a new minister. In trying to decide who this should be a split in the congregation occurred. The majority decided to build a church at Ripley. This they did, erecting a frame building (subsequently veneered with brick) calculated to seat about four hundred and fifty worshippers. This congregation was known as that of Knox Church, while the old church and congregation bore the name of the Huron Church. The Rev. Adam McKay was the minister called to Knox Church. His successors have been the Rev. Alexander Sutherland, the Rev. C. Sinclair, the Rev. P. J. Maxwell, and the Rev. W. A. Bremner. The Huron church called the Rev. A. F. McQueen, who remained in charge until 1893. The Rev. R. McLeod is his successor. This congregation in 1886 built a new church in Ripley, a commodious building of brick, with a seating capacity for five hundred, the cost being about $4,500. Before the congregation deserted their old church, services used to be held at Ripley, in the town hall, on Sunday afternoons, in the English language. Services in both Gaelic and English are still conducted in Huron church. In Knox Church only English is used. The sturdy type of settlers who cleared and settled the township of Huron have been succeeded by a generation who well maintain the standard of their forbears. Those of them who have sought a wider field of action have as a rule been successful, and have made for themselves a name, while they who remain on the old homesteads may be depended upon to keep their native township in the front rank of the municipalities of the county of Bruce.